The theft earlier this month of two of Razer's prototype Razer Blade gaming laptops shouldn't impact the expected release of the device, the company tells Kotaku. Razer discovered the theft of the Razer Blade prototypes mid morning on Saturday, Nov. 5, after an alarm went off at the company, Heathcliff Hatcher, Razer's director of global product marketing, said. Someone had managed to get into the lobby of the building that houses Razer's research and development offices Saturday morning, Hatcher said. The thief or thieves then pried open the door to the office and methodically picked through the desks picking up two of the prototypes from different parts of the office as well as a laptop and digital camera. The rest of the computers and electronic equipment in the office, where roughly 30 people work, were untouched. One of the prototypes was undergoing a weekend-long thermal test, Hatcher said. The thief disconnected the prototype from the tracking equipment before stealing it. The chief reason that Razer decided to make the theft public was because the company is hoping to recover not just the devices, but that testing data. The prototypes are not fully functional, he added. While police are looking into the break-in and theft, they don't yet have any suspects. Hatcher said that police were waiting to look into the log that tracks the security cards used over the weekend to gain entrance to the building's lobby. Whoever broke into Razer did so without needing to break into the lobby, he said. 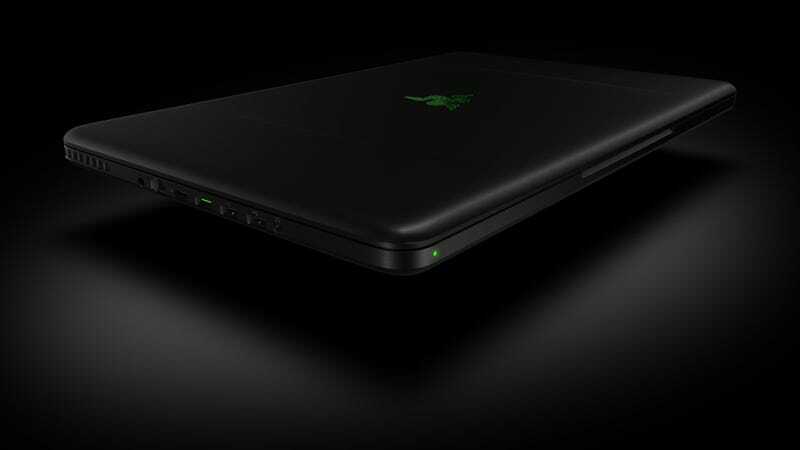 The company is hoping that someone will spot the Razer Blade at a coffee shop or bar. Its long, thin form-factor and glowing green, snake logo should be easy to spot, he said. We were blown away, BLOWN AWAY, by Razer&apos;s surprise laptop announcement this morning. Anyone with information about the theft is asked to contact the company at cult@razerzone.com. You can contact Brian Crecente, the author of this post, at brian@kotaku.com. You can also find him on Twitter, Facebook, and lurking around our #tips page.